A SPRINGTIME QUESTION: I want to plant some flowers around my street tree. Does it hurt a street tree to plant flowers in the soil around it? 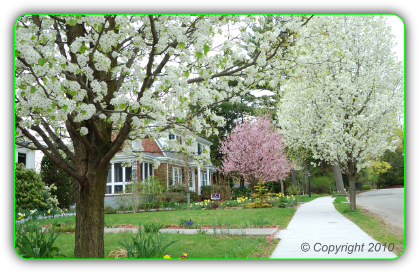 Street trees will probably do OK with flowers planted around them, as long as the tree roots are protected during planting and the new plants don't out-compete the feeder roots of the tree for water, soil oxygen, and nutrients. Some plants to be avoided because of their dense root systems include ferns, hosta, day lilies and grasses. As you plant your flowers in the root zone of a tree, take some precautions to protect the tree roots. 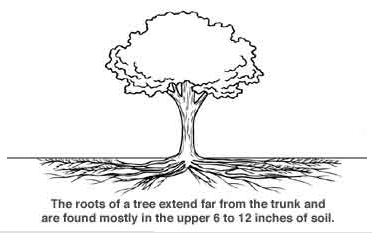 Roots larger than about an inch diameter help stabilize a tree. Take care not to damage or cut these; instead carefully plant around them. You may find a dense network of fine feeder roots in the area where you want to plant. These tiny roots are the ones that take up nutrients and water from the soil. This function is vitally important to the tree, so it is important not to remove any more than is necessary to make space for each flowering plant. If you find feeder roots obstructing the hole you're digging for a new plant, be sure to trim them back cleanly rather than tear them out. Clean cuts are easier for the tree to recover from quickly, which helps minimize the possibility of fungus infection. Water the area thoroughly, both right after you've planted your flowers and anytime the root area seems dry. Good for the flowers AND the tree! AN ALL-YEAR QUESTION: When is the best time to prune a tree? Removal of dying, diseased, broken, rubbing, or dead limbs can be done anytime during the year. Removing dead and damaged tissue can help limit further damage. However live-branch pruning is best done when the tree is dormant, in the winter or before growth resumes in early spring. Growth is maximized, and defects are easier to see. Pruning when trees are dormant can minimize the risk of attack from parasites and diseases associated with wounding and allow trees to take advantage of the full growing season to close and compartmentalize wounds. Dormant pruning is especially important for elms and oaks. Avoid pruning trees during or soon after flowers and leaves appear in the spring. This is when the cambium is active and bark is particularly vulnerable to being torn loose. Avoid pruning in summer too, when trees are still in active growth and may be stressed by drought. 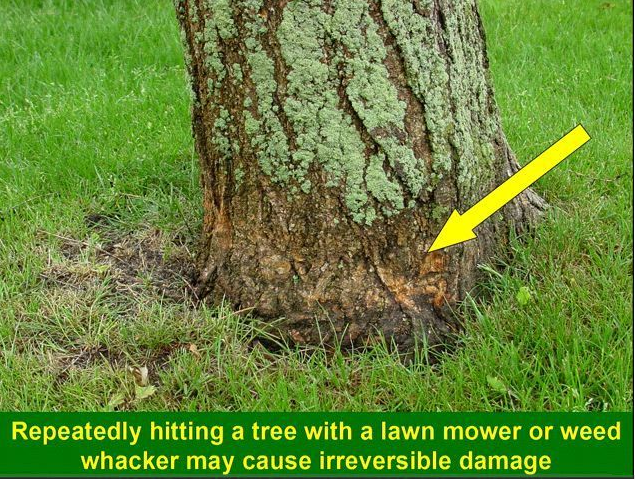 This is especially true for a tree that is already stressed by a limited root area or poor quality soil. Another important consideration is nesting birds! The majority of songbird nests are small and camouflaged. Tree trimmers may not see nests until too late. Also, loud activity of tree trimming can disturb birds in surrounding trees. Birds and active nests are protected from harm or harassment by the Migratory Bird Treaty Act. The Audubon Society advises that if you see tree trimmers disturbing an active nest, TAKE A PICTURE of the nest, the destruction, and the company's name. Report violations to the Law Enforcement Office of U.S. Fish & Wildlife Service at (310) 328-1516 (Office of Investigations and Compliance Inspection). The U.S. Fish and Wildlife Service will issue citations and may levy fines to individuals and companies that blatantly disregard the regulations. A WINTERTIME QUESTION: What can I do to prevent the weight of snow and ice from breaking my tree's branches? If you notice snow build-up on a tree during a snowstorm, shake the snow off the branches as high as you can reach, and keep the branches as clear of ice and snow as you can . A painter's pole is light and easy to handle, and can extend your effective snow removal range. Trees sometimes send out new leafy growth directly from the trunk. These sprouts take energy from the tree that the tree instead could be investing in healthy top growth. If the sprouts are allowed to grow they will eventually get in pedestrians' way and may be torn off, rather than cleanly removed. Torn breaks are routes for infection into a tree. Trunk sprouts can easily be removed by hand while they are still young and tender. The older they are, the more difficult they will be to remove cleanly without a sharp tool. So help a street tree by snapping off new trunk sprouts cleanly with your fingers when you see them. crushes circulatory channels lying just beneath the bark. around a tree can actually kill the tree? 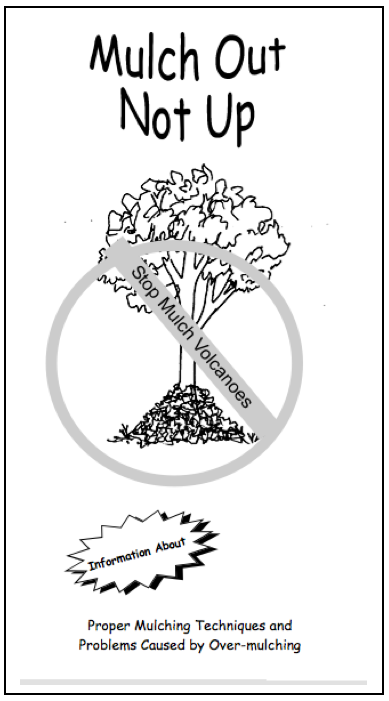 the best way to mulch a tree (pdf). showing exactly how a mulch volcano kills a tree. Did you know that tree roots need oxygen? Both water and oxygen uptake from the soil are vital for tree health. Roots need a soil structure full of tiny holes containing both water and air in order to absorb those nutrients. Parking on the planting strip compresses the soil so that it can no longer hold water and air and kills the feeder roots, which live only in the top few inches of the soil. Same goes for leaving heavy construction materials on the planting strip. Many people think a tree's roots go very deep. tree dries out, so do the feeder roots. Mature street trees too will benefit from regular thorough watering in a drought. The soil around them is often partially covered by hardscape or is of poor quality for holding water. If you want to help a mature tree in a drought, water its full root area thoroughly, once a week, at least as far out as the farthest branches extend. Please contact the Tree Warden as soon as you see damage to a street tree! Prompt first aid by a knowledgeable arborist will minimize the routes for infection and help prolong the life of the tree. And a very badly damaged tree may be a hazard to public safety. aid to clean up damaged branches and bark. 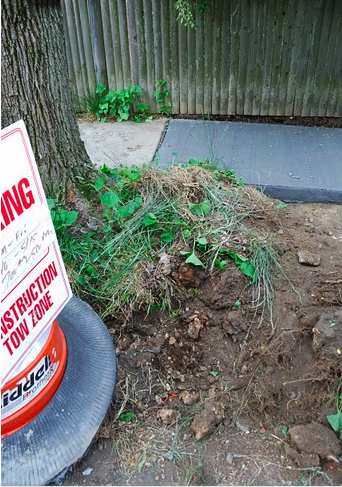 Street and sidewalk renovation is hard on street trees. 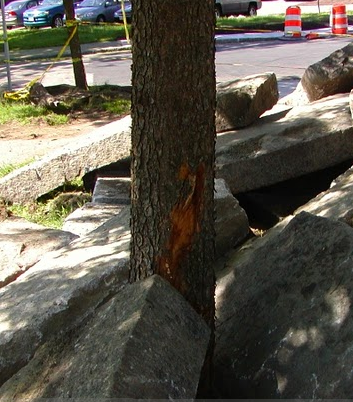 If you see street tree damage in process, please call the Tree Warden AND the Watertown Police. This is destruction of public property, and the perpetrator must recompense the Town. In the case of car impact, the car owner's auto insurance will pay for the damage, but only if the police can file a report identifying the driver. Recompense for destruction of a public shade tree is calculated using a formula based on the diameter of the tree. Sadly, residents in neighborhoods affected by the loss of a mature tree probably won't see the benefit realized. It takes decades to grow a new street tree to a size to provide all the benefits of a mature public shade tree. Please immediately report a dead tree to the Tree Warden. Quick notification can save the town money, and the sooner a dead tree is removed, the sooner a healthy new tree can be planted in the same site.